Tonight come out to Restaurant 3 from 5 to 10PM for a happy hour fundraiser for the Leukemia & Lymphoma Society. This free event includes 3 drinks specials and 3 great raffle items: a Scion tC; dinner for 2 at Jaleo, and a massage from Capitol Rehab. This Friday April 30 the Caribbean Breeze Restaurant is rolling out the red carpet – literally – for Washingtonians at the 3rd Annual Spring-Summer Fashion Show. Former Washington Redskin LaVar Arrington and his wife, Trish, will host the event, with proceeds benefiting the Susan G. Komen Race for the Cure Against Breast Cancer. The public is invited to purchase tickets at http://caribbeanbreezeva.com/html/fashion_show.html or by calling (703) 812-7997 for $15 in advance and $20 at the door. Proceeds will benefit Race for the Cure. Thanks to Stacy Viera for the tip! Northside Social and its General Manager and Wine Director, Alison Christ, is hosting a wine tasting tonight, April 28, at 6:30 p.m. with Hillinger's Assistant Winemaker and Sommelier, Michael Hoeffken. Michael will guide you through the Hillinger portfolio - a fun tasting that will explore some great Austrian wines. The cost is $35 per person and includes 5 wines and small plate food pairings. For reservations please call or e-mail Alison Christ at 571-283-3144 or alisonmchrist@yahoo.com. Clarendon Alliance hosted a very well attended networking event at Restaurant 3, the third venue opened by the owners of Whitlow's, this evening. The rear bar area was packed with local bloggers and businesses and provided a great place to match up faces to the names/websites that I've shared links with for the past two years. The Clarendon Alliance is a local association of business and government representatives that has been active since 1986. Over the past five months there has been a dramatic increase in the number of local bloggers and writers around Arlington, and it is a great boost to have so much energy in the area. Looking forward to more Clarendon-centered meet-ups and collaborations! Deals For Deeds is a group buying website with a twist of supporting community non-profits. The service gives a percent of every purchase to one of three local charities each month, including the Washington Animal Rescue League, Food & Friends, and Habitat for Humanity of DC. A big part of Deals For Deeds is allowing community members to suggest their favorite non-profits and local businesses for them to feature, and they already have received a number of recommendations on their Facebook page. They are having a site launch party at ACKC DC, 1529C 14th Street NW from 6 to 9pm Tuesday night. Its free, no RSVP necessary, meet local businesses, and get complimentary drinks/food! 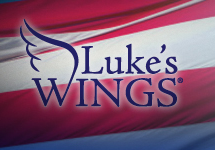 Tonight come by Iota at 7pm to for some great music and to raise money for Luke's Wings, a organization dedicated to the support of service members who have been wounded in battle. Headlining at the benefit is pop/rock/soul five member band Tim Be Told. Also playing is Crash Bang Boom, who I was surprised to see play at the Gap at Tyson's Corner. David Zaidain will also be on stage tonight. Many people took advantage of the pleasant weather and break from the rain tonight, especially at Clarendon's newest late night venue Spider Kelly's. 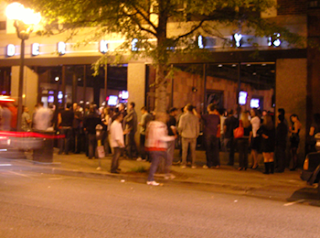 The large bar and pool hall had a long block-sized line of revelers waiting to get in, which made the Ballroom's 12 person deep line look tiny. I'm sure many of those people were out trying to forget about the Caps loss tonight. Down the street, Eilen Jewell played to a full show at Iota with her calm and original Western-Country-Folk tunes and 80s cover band The Reflex entertained at the Clarendon Grill. I wanted to check out the brand new Lyon Hall's menu this Thursday night, as I've heard so much buzz about it. But when I walked in at about 6pm it was already full, and because the kitchen is not yet in full swing they have limited number of tables open for dinner service. I will come back another day, and I recommend to call first and make a reservation if you want to try this French brasserie. Instead, I dined at another popular local establishment, Mexicali Blues. On the corner of Garfield Street in the middle of the Clarendon strip, it has ample outdoor seating. I wasn't that impressed with Mexicali Blues' food offerings. Some portions like their burritos are quite large, but their tacos seem lacking and underwhelming. But this venue really stands out as a great happy hour location. It's laid back and airy outdoor seating puts anyone in a good mood when meeting up for drinks after work, and they serve $1.50 drafts from 5 - 7pm Wed and Thurs nights. Recommended for a nice happy hour spot for friends or coworkers! After much anticipation, Lyon Hall should be officially open to the public tonight. The high end and stylish restaurant has generated a good deal of buzz and I'm sure it will be packed this upcoming weekend. 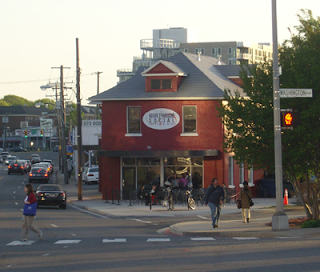 It's in a good location, just two blocks directly south from Clarendon Metro station on North Highland Street. 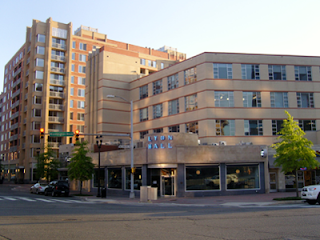 Being flanked by the Phoenix Condo tower, the Reserve Apartment tower, 7-11, and Moby Dicks, Lyon Hall brings some commercial diversity to this corner in Clarendon. For a sneak peak into Lyon Hall before it opens, check out Arlnow.com's picture gallery here. Local realtor and resident Laura Rubinchuk claims to be in love with the new coffee shop Northside Social, and I can see why. The swanky venue that replaced Murky Coffee is now open and has rebuilt been to make a great use of interior space. I don't think its fair to try to compare this new shop, founded by the same owners as Liberty Tavern, to its previous tenet Murky Coffee which closed a year ago. Northside Social has a very different feel and style, and is still a great alternative to the ubiquitous Starbucks. This coffee shop on the very western edge of Clarendon would make for a perfect first date location. I'm sure its ample outdoor seating will be in demand when this summer warms up! 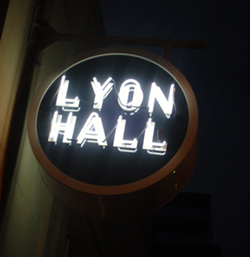 Everyone is a buzz about Clarendon's newest restaurant Lyon Hall on Washington Blvd. Adjacent to the remodeled Post Office complex in the Phoenix building, it is strategically located just south of the heart of Clarendon's strip. They will officially open to the public this Tuesday, as for the past few days its been packed with private parties. I'm really looking forward to trying out its excellent beer collection, and its already being compared to Brasserie Beck! Other local bloggers have great reviews and lots of sneak peak photos, like Arlnow.com and NorthernVAMag. 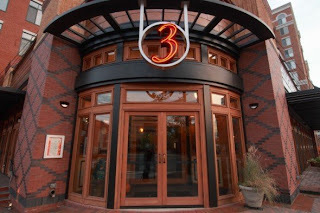 Today Restaurant 3 will be hosting a charity happy hour from 6 to 9pm. 15% of bar sales that night will go to the worthy Ronald McDonald House Charities, which provides housing to families with hospitalized children. They will be offering featured glasses of wine for $5, drafts for $3 and feature half price bottles. There will be great door prizes and silent auction items including an autographed Alexander Ovechkin jersey. If you are interested in volunteering, check out the Young Professionals council who organized it. 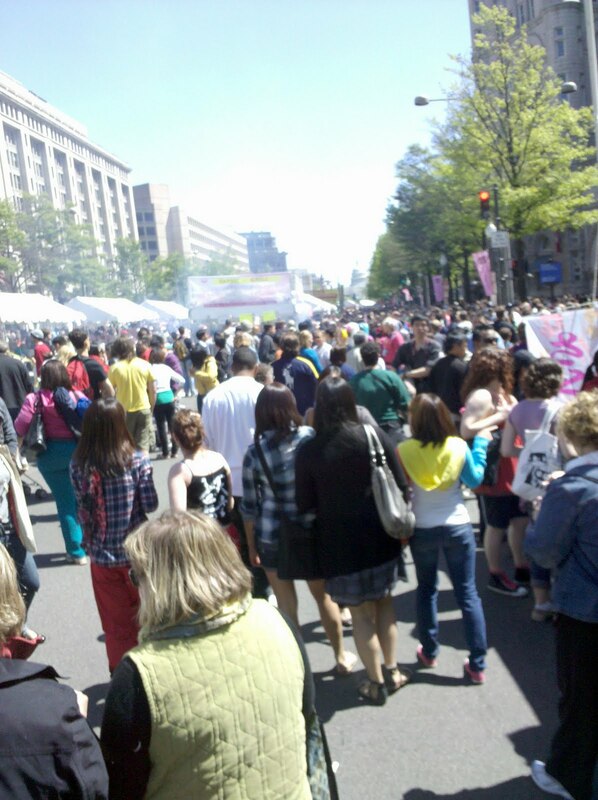 "The Sakura Matsuri Japanese Street Festival is a free major event of the National Cherry Blossom Festival in Washington, DC. 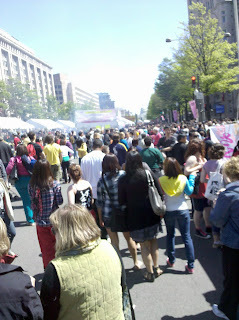 It is the biggest Japanese street party in the nation. The festival stretches six blocks and includes Japanese performances on five stages, 20 Japanese and Asian restaurants, 30 interactive cultural exhibits and 35 vendors selling Japanese products." Phoenix Bikes is a local non-profit bike shop dedicated to empowering young leaders through a program that teaches entrepreneurship, leadership and teamwork. 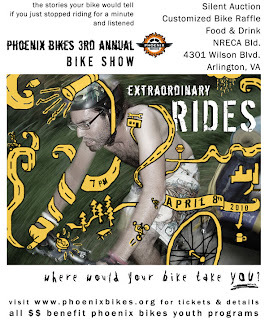 Come out to support this great local store, which I can personally attest to the friendliness and helpfulness of its staff in purchasing a bike. 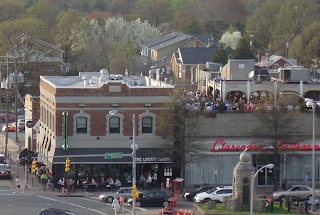 The extremely welcome 80 degree weather today is definitely going to lead to a very packed and lively Clarendon tonight. I would suggest taking advantage ASAP of the venues that offer outdoor service, like Jay's, Hard Times, Mexicali Blues, RiRa, Liberty Tavern and the tiny alley of Galaxy Hut. Later tonight check out the frequent Arlington favorite Justin Trawick performing at Iota. Also Arlington Cinema Drafthouse is hosting a MST3K "rifting" style live parody of Karate Kid. Make sure to check out the Drafthouse next weekend for the standup comedy of Kristen Schall from Flight of the ConChords and recently on Modern Family.